For other uses, see Central provinces (disambiguation). This article incorporates text from a publication now in the public domain: Chisholm, Hugh, ed. (1911). "Central Provinces and Berar" . Encyclopædia Britannica. 5 (11th ed.). Cambridge University Press. pp. 681–3. The Central Provinces was a province of British India. It comprised British conquests from the Mughals and Marathas in central India, and covered parts of present-day Madhya Pradesh, Chhattisgarh and Maharashtra states. Its capital was Nagpur. It became the Central Provinces and Berar in 1936. The Central Provinces was formed in 1861 by the merger of the Saugor and Nerbudda Territories and Nagpur Province. The district of Nimar which was administered by the Central India Agency was added in 1864. It was almost an island encircled by a sea of "native States" such as Bhopal State and Rewa State to the north, the Chota Nagpur States and Kalahandi State to the east, and the Nizam's territories of Hyderabad to the south and Berar to the west. The Central Provinces was landlocked, occupying the mountain ranges, plateaus, and river valleys in the centre of the Indian Subcontinent. The northernmost portion of the state extended onto the Bundelkhand upland, whose northward-flowing rivers are tributaries of the Yamuna and Ganges. The Vindhya Range runs east and west, forming the watershed between the Ganges-Yamuna basin and the Narmada River basin, which occupies the center and west of the province, and flows westward to empty into the Arabian Sea. The upper Narmada valley forms the center of the Mahakoshal region. Jabalpur (formerly Jubbulpore) lay on the upper Narmada, and was an important railway junction. The Satpura Range divides the Narmada valley from the Deccan Plateau to the south. The Central Provinces included the northeastern portion of the Deccan, drained by tributaries of the Godavari River including the Wainganga, Wardha, and Indravati. A portion of Berar lay in the upper basin of the Tapti River, which drains westward into the Arabian Sea. The portion of the Central Provinces on the Deccan Plateau formed the Vidarbha region, which includes Nagpur, the capital of the province. The eastern portion of the state lay in the upper Mahanadi River basin, which forms fertile rice-growing region of Chhattisgarh. The Maikal Range separates the basins of the Narmada and the Mahanadi. The Chota Nagpur Plateau extended into the northeast corner of the province. General censuses were held in 1866, 1872, 1881, 1891, 1901, 1911, 1921, and 1931. The population in 1866 was over 9 million, and in 1872 over 9.25 million. 1869 was a famine year. There were epidemics of smallpox and cholera in 1872, 1878, and 1879. By 1881 the population had risen to 11.5 million, and by 1891 to nearly 13 million. The population in 1901 was 11,873,029, a reduction of 800,000 from 1891. The lack of summer monsoon rains in 1897 and 1900 led to widespread crop failures and huge famines in those years, and there were partial crop failures in four other years in the decade, with epidemics of cholera in seven of the ten years. A portion of the decrease (between one-eighth and one-quarter) was from emigration to Assam and other provinces of India. The 1911 census counted a population of 16,033,310 for the Central Provinces and Berar. Droughts in 1917 and 1920 caused famine in several districts, and the Central Provinces were affected by bubonic plague in 1911, 1912, 1915, 1917, and 1918, and by the 1918 influenza pandemic. In the 1921 census, the population declined by 0.3% from 1911 to 15,970,660. The 1931 census found a total population of 17,990,937 for the Central Provinces and Berar - 12,065,885 for the British districts, 3,441,838 for Berar, and 2,483,214 in the princely states. The central Provinces contained two distinct linguistic regions: Mahakoshal, consisting mainly of Hindi-speaking districts, and Vidarbha, chiefly, but not exclusively, a Marathi-speaking area. The linguistic regions could not be fully integrated as a unit. In the 1901 census, 6,111,000 (63% percent) of the population spoke variants of Hindi, chiefly Chhattisgarhi (27%), Bundeli (15%), Bagheli (10%) and Malvi or Rajasthani (5%). 2,107,000 (20%) spoke Marathi, the majority language of Wardha, Nagpur, Chanda, and Bhandara districts, and the southern portions of Nimar, Betul, Chhindwara, and Balaghat districts. Oriya speakers numbered 1,600,000, or 13.5%, but the transfer of Sambalpur District to Bengal in 1905 reduced the number of Oriya speakers to 292,000. There were 94,000 Telugu speakers, mostly in Chanda District. Of the 730,000 who spoke other Dravidian languages, the majority spoke Gondi, and 60,000 spoke Korku. 74,000 spoke Munda languages. The Central Provinces were administered from 1861 to 1920 by a Chief Commissioner. Administratively, the Central Provinces consisted of four divisions (Nerbudda, Jubbulpore, Nagpur, and Chhattisgarh), which were further divided into 18 districts - five districts in each division except Chhattisgarh, which had three districts. Berar was under the administrative authority of the Chief Commissioner for the Central Provinces, but administered separately. The Central Provinces also contained 15 princely states, which accounted for 31,188 square miles and a population in 1901 of 1,631,140, approximately 15% of the total population. The largest was Bastar, with an area of 13,062 miles, and the smallest was Satki, with an area of 138 square miles. The princely states were in Chhattisgarh Division, except for Makrai, which was in Hoshangabad District. In 1903, the Marathi-speaking Berar region of the Hyderabad princely state was placed under the administration of the Governor of the Central Provinces, although it officially remained part of Hyderabad, leased in perpetuity by the Government of India. In 1905, most of Sambalpur District and the princely states of Bamra, Rairakhol, Sonpur, Patna, and Kalahandi were transferred to Bengal Province and the princely states of Changbhakar, Korea, Surguja, Udaipur, and Jashpur were transferred from Bengal to the Central Provinces. The Government of India Act, 1912 permitted the creation of legislative councils for provinces under a chief commissioner, and on 8 November 1913 the Central Provinces Legislative Council was formed. The Government of India Act, 1919 changed the administrator of the province from a chief commissioner to a governor, and enlarged the legislative council and expanded the voting franchise. The first elections for the Legislative Council under the 1919 Montagu-Chelmsford reforms were in November and December 1920. The Council consisted of 71 members - 53 elected members, 2 ex-officio members (members of Executive Council), and 16 official and non-official nominated members (Zamindar owners declared as backward, Depressed Classes, Europeans and Anglo-Indians). Out of the 53 elected members, 40 came from general constituencies (30 rural and 10 urban), 7 communal constituencies and 6 special constituencies (Central Provinces & Berar Mining Association, Central Provinces & Berar Commerce & Industry Association, Berar Commerce & Industry, and Central Provinces & Berar Landholders). The Indian National Congress had decided at its Calcutta Conference to boycott the elections as part of the Non-cooperation Movement, and many prominent nationalist leaders, including Ravishankar Shukla, E. Raghavendra Rao, B. S. Moonje, Daulat Singh, Makhan Lal Chaturvedi, and Vishnudutta Shukla, either decided not to run, or withdrew their candidacies. The legislative seats went mostly to Liberals and loyalists. Gangadhar Rao Chitnavis was nominated as the President of the Council. The Montagu-Chelmsford reforms also introduced the principle of dyarchy, whereby certain responsibilities such as agriculture, health, education, and local government, were transferred to elected ministers but some responsibilities such as home, finance and revenue were reserved with the Members of the Executive Council of the Governor. Some of the Indians who served as members of the Governor's Executive Council were Moropant Vishvanath Joshi (Home) and E. Raghavendra Rao. By 1923, the nationalists had decided to participate in the legislative elections, and in the November and December 1923 election, and the Swaraj Party, which advocated Indian independence, won 41 of the 54 elected seats. 4 seats went to independents who generally allied with the Swarajists, four to the Liberals, and five to independents allied with the Liberals. The Swarajists were led by B. S. Moonje from Vidarbha, E. Raghavendra Rao from Mahakoshal, and S. B. Tambe and B. G. Khaparde of Berar. S. M. Chitnavis was leader of the Liberals. Despite winning a majority of seats, the Swarajists, consistent with the party's policy of obstruction and non-acceptance of office, refused to form a government, and Governor Frank Sly selected Chitnavis and Syed Hifazat Ali, a Muslim independent, as ministers. In the 1926 election, the Swarajists split, with one faction continuing with the policies of obstruction and non-acceptance of office, while the Responsive Cooperation Party which chose to participate in government. After the election B. S. Moonje formed a ministry by uniting Responsive Cooperation, Independent Congress, Liberal, and independent legislators into a National Party, with 33 members. The ministry collapsed in 1933 due to infighting among the ministers and a new ministry was formed under Raghavendra Rao with Muhammad Yusuf Shareef and V. B. Choubal as ministers. This ministry collapsed in 1934 and a new ministry was formed with B. G. Khaparde as Chief Minister and K. S. Naidu as the other minister. This ministry remained in office till 1937. In 1933 the princely states in Chhattisgarh Division were transferred to the Eastern States Agency, and Makrai to the Central India Agency. 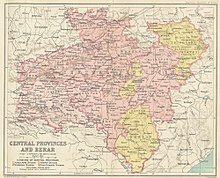 On 24 October 1936, the Central Provinces became the Central Provinces and Berar when it was fully merged with Berar Division, although it remained under the nominal sovereignty of Hyderabad. ^ a b c d e Pateriya, Raghaw Raman. Provincial Legislatures and the National Movement. New Delhi: Northern Book Centre. ISBN 81-85119-58-9. ^ Philip F. McEldowney (1980). Colonial Administration and Social Developments in middle India: The Central Provinces, 1861-1921 - Ph. D. Dissertation. University of Virginia. ^ Imperial Gazetteer of India, (New ed. ), Oxford: Clarendon Press, 1908-1909. Vol. 10, Page 19. ^ Imperial Gazetteer of India, (New ed. ), Oxford: Clarendon Press, 1908-1909. Vol. 10, pp. 24-25. ^ Imperial Gazetteer of India, (New ed. ), Oxford: Clarendon Press, 1908-1909. Vol. 10, Page 65. ^ Imperial Gazetteer of India, (New ed. ), Oxford: Clarendon Press, 1908-1909. Vol. 10, Page 1.